← And the Grammy Doesn’t go to…. Okay there is nothing pathetic about the King of Rock and Roll as he is known, although arguably Little Richard deserves the title. However, I digress. What’s pathetic was the wasted end of his extraordinary life and many opinions abound about what happened to the King at the time of his premature death at 42. The last six months of Elvis’ life were something of a miracle in that he could even perform onstage without falling over. He lived on various prescription medications 24-7 and he drank heavily. Often he appeared in concert making embarrassing mistakes that he managed to cover up with his natural charm and good humour. Up to the end Elvis was able to laugh at himself. Perhaps that was why no one saw the end coming. By 41, Elvis was obese, his behavior had become more bizarre yet he remained one of the most popular celebrities in the world. In private, his entourage watched and worried as he became a nocturnal creature who would rent an amusement park outside Memphis so he could ride the roller coaster at night, then covered hotel-room windows with aluminum foil to keep daylight out. His dependence on stimulants, sedatives and painkillers was legendary. by 1974, Elvis was a sick man. And it seemed that none of the people he gathered around him could do anything to stop him from slipping away. His stepmother Dee felt “suffocated” by Elvis’ father Vernon and she moved out, along with Linda Thompson, Elvis’ girlfriend, who packed her bags and left Graceland, as Priscilla had some years before. Everyone around him seemed to be abandoning him. gut. He was slurring. He was so fucked up. It was obvious he was drugged, that there was something terribly wrong with his body. It was so bad, the words to the songs were barely intelligible. He could barely get through the introductions. We were in a state of shock. I remember crying. He cut the show short, yet it seemed like it went on forever. 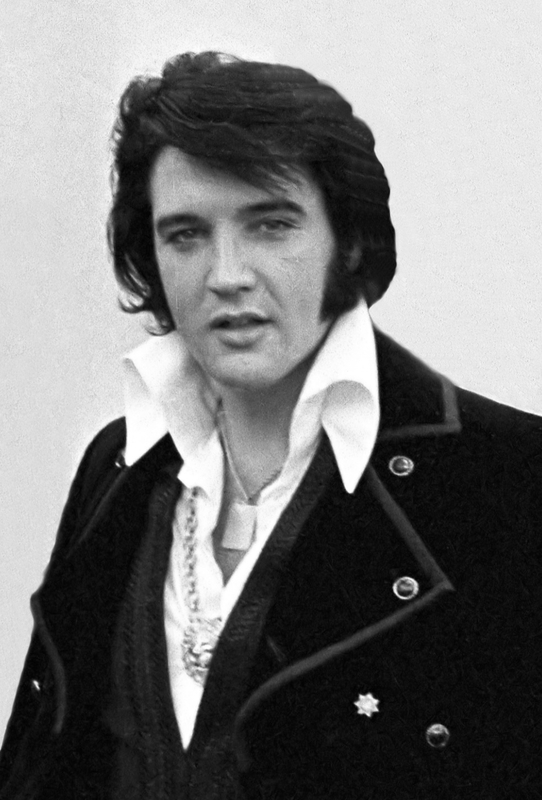 On January 28, 1975, Elvis attended the 18th floor of Baptist Hospital. It was discovered that he suffered from an enlarged colon, and a more serious problem that was never disclosed to the public, showed up in a liver biopsy. There was severe damage to his liver and the probable cause was drug abuse. The colon problem was caused by Elvis’ poor eating habits. Elvis loved fried foods and sugar, and needed a complete and immediate change in diet if he was going to survive. Those are fighting words for most people but not for Elvis Presley. Perhaps it was his natural optimism that left him unconcerned for his health. Or it might have been that his life as a superstar made him feel immune to his medical issues. At either rate, Elvis’ poor eating habits and drug abuse continued unabated. Pontiac, Michigan, which seated 80,000 people because he needed the money. His bank accounts were empty, and he had borrowed money against future earnings, using Graceland for collateral. The man was broke. Every way except economically, the show was a disaster. Elvis was confused when he stepped onstage. His sidemen and singers were below him on another level. He was surprised and angry. He didn’t want to sing alone. Then his pants ripped, splitting at the seams because of his extra poundage. The temperature made it worse. It was so cold, the members of the band were playing in their overcoats. “The trumpet players’ lips were so cold they could barely blow their horns. It was so cold [that guitar] strings kept changing key.”There were many interesting and strange business developments in Elvis’ life at the time, too many to document here. Ginger Alden [his last girlfriend] said they continued to make wedding plans, during the last week of his life, claiming that he was going to make an announcement at a concert in Memphis at the end of the tour. He read his Bible and his numbers book. He ate his cheeseburgers and took his pills. On August 14th, he started a fast, something he often did to lose weight quickly before going on tour. Oddly, he didn’t take any Ionamin, the appetite suppressant he’d favored for so long. At 250 pounds, he was grossly overweight, however, and how much could he lose in two days? Ultimately it wasn’t his weight Elvis would lose; it was his life. During the last day, Elvis played a game of squash, then fell into a melancholy mood. He played piano and sang for Ginger and some friends, which lightened his mood. However overall his mood swings were “scary.” People around him had to try not to let Elvis’ moods affect them. During the evening Elvis remarked,”I’m going to make this the best tour ever.” By two or 2:30 a.m., Elvis had changed into a striped workout suit. Elvis retired to his bedroom about four a.m. Elvis developed considerable abdominal pain at this point, directly related to his enlarged colon. He told Ginger he was going to read in the bathroom. Hours later, Ginger discovered him prone on the bathroom floor. He was inert. His mouth was shut tight; it wasn’t possible to attempt rescusitation.The autopsy would show he had as many ten different drugs in his body. Four of the drugs were in “significant amounts.” These were codeine, ethinamate, methaqualone and unidentifiable barbiturates. He had taken a number of Placidyl and Valium capsules, both tranquilizers, and unknown quantities of Demerol and Meperidine, both painkillers. 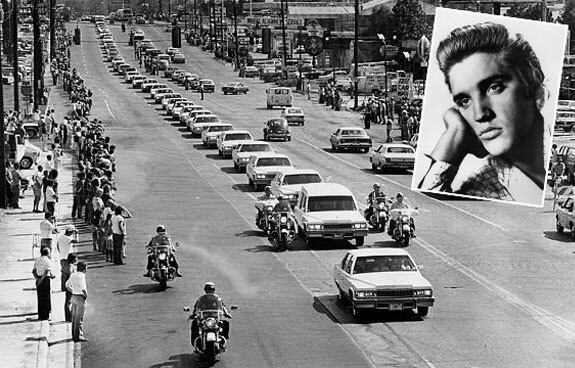 The last year and days of Elvis Presley’s life were among the most pitiful he’d ever lived. No doubt the man would have made more rock and roll hits and completed more successful tours had he been able to control his drug and eating habits. But the strain on his body was too much, even for an earthbound star. He was a music icon whose life ended in a manner the opposite of what one would expect of a living legend: not with a bang but a whimper.